Just a few years ago, providing context-sensitive software product documentation was a goal for many technical communication teams. The aim was to provide contextually relevant—and helpful—content based on a customer's location in a software product. By breaking large technical documents into smaller pieces, these forward-thinking companies were able to make discrete chunks of content available in the product interface; no need for customers to go looking for assistance in a user manual or online help portal. Today, contextually relevant content is expected by digitally-savvy consumers. The definition of context has broadened to include many additional factors (user profile data, geographic location, product model, version number, preferred language, time zone, previous interaction history, and the capabilities of the device used to consume the content). Providing contextually-relevant content today is no trivial matter. It's challenging, especially for teams that have not adopted advanced information development management practices, e-methods, and tools. Join me, Scott Abel, The Content Wrangler, for a free, one-hour webinar with structured content expert, Alex Masycheff, co-founder and CEO of Intuillion Ltd. We'll discuss how emerging delivery technologies can leverage structured technical content to deliver contextually relevant content via conversational user interfaces like chatbots. We'll delve into how chatbots can be used to provide improved context-sensitive assistance and we'll demystify the five elements that make chatbots a valuable addition to our customer experience arsenal. 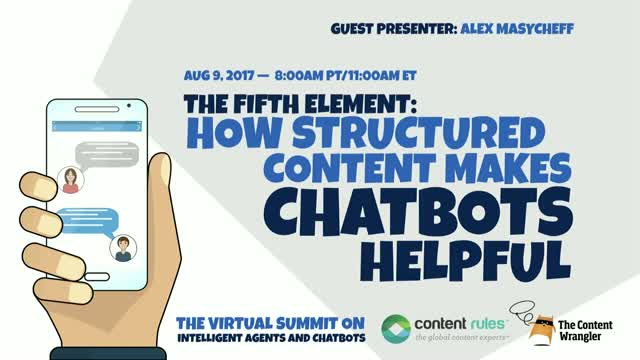 Attendees will learn when chatbots bring the greatest value; what makes a chatbot helpful; and, why structured content is critical to chatbot project success.